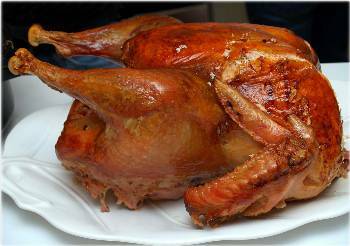 Barbecued Turkey Recipe with No mess in your oven or the kitchen. A whole turkey can easily be prepared on your gas grill or charcoal grill. This process requires a covered barbecue grill and heavy duty aluminum foil. Your turkey will be crisp outside and juicy inside. Clean turkey well, removing any bits of pin feathers and cleaning the cavity of any remaining pieces of innards. Pat dry with paper towels. Tie down the legs with twine or clips. Preheat barbecue grill. Instead of using a roasting pan, it is easier to use a homemade pan from extra heavy duty foil - using three layers of foil and making it just big enough to hold the bird; the sides need to be about 2 1/2" high. Rub the inside cavity of the turkey with 1/2 of the softened butter. Stuff the inside cavity with your favorite stuffing/dressing recipe. With any remaining turkey stuffing, stuff a little of it between the skin and the breast meat. With the remaining butter, rub some over the skin of the turkey. Also place a little stuffing in the neck cavity, tuck the neck skin under and skewer shut. Salt and pepper the turkey and place the slices of uncooked bacon on top of the prepared turkey. Place the turkey crosswise on the gas or charcoal grill so that the pan is evenly distributed over the two sets of jets. Set the flame so that a temperature of 300 to 325 degrees F. is maintained (usually the lowest setting). Cover with heavy duty foil for the majority of the cooking time. Estimated cooking time is approximately 20 minutes per pound at 300 degrees F.
Remove the aluminum foil for the last hour of cooking. Every once in while, baste the turkey with Jake's Original Barbecue sauce. If you have "hot spots" in the jets of the grill, twice during the cooking turn the turkey around (and the pan, of course) so that one side is not more cooked than another. Toward the end of the cooking time, open the grill and insert the meat thermometer into the fleshy part of the thigh and cook until the internal temperature reaches 165° F (remember that the turkey will continue to cook after it is removed from the heat of the fire). NOTE: This year, the USDA has come up with a one-temperature-suits-all for poultry safety: 165° F. For safety and doneness, the internal temperature should be checked with a meat thermometer. In the absence of a meat thermometer, pierce the turkey with a fork in several places; juices should be clear with no trace of pink. NOTE: The old-fashioned way of wiggling the leg to see if it's loose will give you an indication that the turkey is ready, but unfortunately, by the time the leg is truly loose, the turkey is sadly overcooked. The only reliable test for doneness is to check the internal temperature with a meat thermometer in the thickest part of the thigh, without touching the bone. Keep a small dish on the side as a condiment container for our bbq sauce for turkey. You can warm the sauce in the dish using a microwave for 40 seconds or place the bbq sauce for turkey in a pot and heat on the stove. Pour in container and serve. For general roasting of stuffed and unstuffed Turkeys here's a cooking chart.